The scallop shell has long been used as the symbol of the pilgrim. My customers are great walkers and have walked the pilgrim route to Santiago de Compostella in Spain. A move into a lovely house in Surrey with a beehive inglenook (a fireplace built in the shape of a bee hive as seen from outside) prompted them to find a way of creating a reminder of their walk in stained glass. Their fireplace has an arched window on either side which looks out onto the garden. 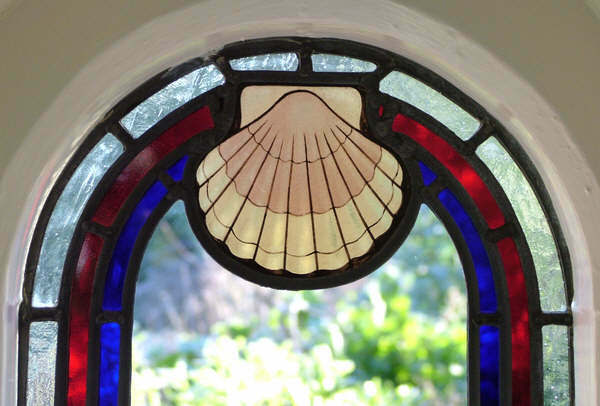 The stained glass has a blue and ruby border reminiscent of medieval stained glass colours and the hand painted scallop shells crown the design. The centre of these stained glass windows is in clear glass framing the wonderful plants in the garden. With the sun streaming through they look fantastic and the scallop shells glow. Error: Error validating access token: Session has expired on Monday, 08-Apr-19 03:56:55 PDT. The current time is Friday, 19-Apr-19 12:08:24 PDT.